There are many tools you can use to measure your website traffic (see this roundup) and get varying degrees of data and insight about your visitors. For subscription based businesses, apps and some other business models, it makes sense to take things a step further and that's where advanced customer analytics come in. On the Thrive Themes webiste, I recently published some sales pages and landing pages that… well, let’s just say they aren’t ideal. They may not be catastrophically bad, but if I look at the best sales pages I’ve ever created and compare that to these new pages, a huge difference in quality is apparent. Sometimes, your brain and your human intuition are your worst enemies. Too many mistakes are made because something seems right, but turns out to be wrong. Whatever your business is, there comes a point in time when the proverbial rubber hits the road: you open up for business and wait with bated breath for your first orders to come through (and if you follow the Impact System and other advice I’ve given on this topic, this should happen sooner rather than later). Are You Ignoring the First and Most Vital Conversion? The purpose of your website is to bring you more business. Because of this, you’re most likely to focus your time and attention on the end of the funnel – the part where you make money. As important as it is to optimize those last steps in the funnel, it can also be a dangerous distraction from what might be the most important conversion your website has to achieve. OptimizePress is a very popular theme that transforms a WordPress website into something like a Swiss army knife for marketers. 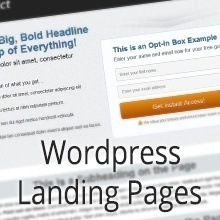 With it, you can easily create sales-pages, launch-pages and lead capture pages. However, it is not the only theme of this kind and neither is it the newest. Is OptimizePress 2.0 the best option, or is there an alternative that’s better suited to your business? Read this review to find out which of the following solutions takes the crown: 10 Minute Pages, Authority Pro 3, FlexSqueeze, InstaBuilder, OptimizePress 2.0, Premise, ProAffiliate Theme, ProfitsTheme, PT Instant, SalesPress Pro or WP Enlighten. I’ve said before that selling is easier than blogging. In fact, I’ve said things along those lines many times. In this post, you’ll discover exactly how creating and selling great products is a traffic generation strategy in itself (when it’s done right). Read on to learn what steps you can take, to drive more traffic to your products and get more customers. Nothing converts like a good video. There are countless studies showing how effective videos are at turning visitors into customers. Certainly, video has been one of the most valuable additions to my marketing toolbox and I’ve been doing video for a long time. But what exactly goes into making a high-conversion sales video? How do I go about creating these videos and what elements are included to make sure the video is engaging, interesting and leads to sales? These are questions I get asked a lot and below is the most comprehensive answer I can give in a blog-post format. There, I said it. Everyone worries about traffic and tries to get more of it. I did the same, when I was starting out. Over the past few years, I have learnt about a skill that is much more valuable than traffic generation and focusing on this skill will get your business off the ground much more quickly. This is an older post on a very important topic. We have since covered this in much more detail in a series of podcast episodes. I rec﻿﻿﻿﻿ommend starting here to get a more in-depth view of why traffic is overrated and how to apply a "Customer First" approach to building your business. I’ve published a review which pitted OptimizePress 2 against all the major WordPress sales-page-building themes and plugins. I’ve also published a review of LeadPages, which is an online application made for creating landing pages of various kinds. OptimizePress 2.0 and LeadPages can’t really be called similar products, but there is quite a bit of overlap in their purpose. Some web-pages are important, pivotal points in your business. Pages like opt-in pages, post-opt-in confirmation pages and webinar registration pages, for example. Getting a higher conversion rate on such a pivotal page has a positive effect that carries on all the way through your funnel. LeadPages is a software-as-a-service solution that is meant to make it especially easy to create (and improve) exactly these kinds of pivotal landing pages in your business. Check out this review to find out exactly what this software offers and whether it stands up to closer scrutiny.